If there is one thing that I always want to make for Christmas, it is something special for a morning brunch. 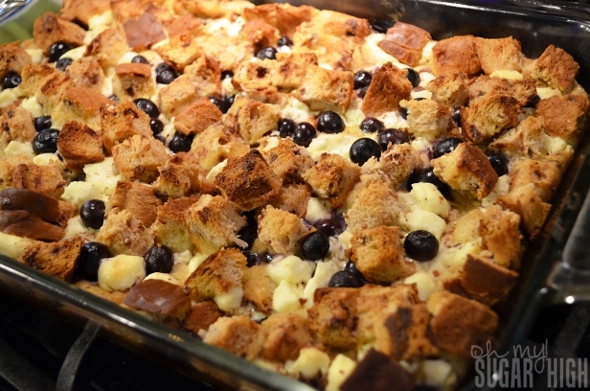 Rather than spend all morning in the kitchen, you can instead prepare a recipe like this Blueberry Strata (which I altered a bit) the night before and pop it in the oven for an hour the following day. This year I made this strata along with my Simple Orange Rolls. My mom prepared some scrambled eggs with cheese, breakfast meat and a fruit tray. We had quite the feast! Rather than use a plain white bread, I opted for a cinnamon burst bread which has the thickness of a Texas toast. Love this and am fortunate that my local grocery store has this available in their bakery. 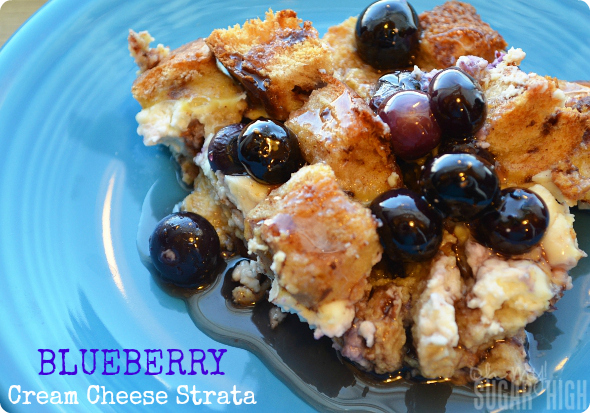 While I love what the extra blueberries boiled in syrup for over the top, you could instead add more blueberries into the strata and just serve with syrup if you want to keep it simple. In medium bowl, whisk eggs, milk and cinnamon together until well blended. (If using cinnamon bread, use 1 tsp.of cinnamon. For plain white bread, use 2 tsp.) Add 1/3 cup syrup and brown sugar. Mix well. Pour over bread and cover with aluminum foil. Refrigerate 12 hours or overnight. Heat oven to 350ºF. Bake strata, covered, 1 hour to 1 hour 5 min. or until center is set and top is lightly browned. Be sure to uncover after 30 minutes of baking to brown the top. 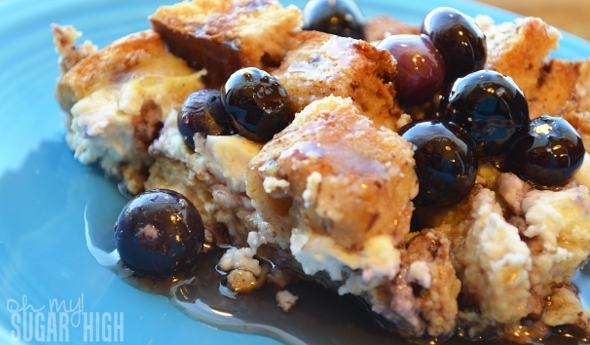 For the blueberry topping, bring 2/3 cup syrup and 1 cup blueberries to boil in saucepan, stirring constantly. Once boiling, reduce heat to medium-low and simmer an additional minute, stirring constantly. Serve over individual servings of strata. Tip: To help check for doneness, use a glass baking dish so you can see how brown the edges and bottom are getting. The trick is to cook it long enough so it isn’t too mushy but not too long that you burn the bread.